When saving pepper seeds, we've found you get the best results if you start with an heirloom variety. There are lots of heirloom peppers, both sweet and hot, that are readily available from lots of seed catalogs and online retailers. The most common heirloom bell pepper variety is probably the California Wonder. Marconi and Friggitello are probably the most common heirloom varieties of sweet Italian peppers. For hot peppers, Tabasco, Serrano, Caribbean Red, Thai and cayenne are just a few of many heirloom varieties. If you start with a hybrid variety, the resulting plants won't be identical to the parent plant. When you plant seeds from a hybrid variety, you really don't know what you'll get. Oftentimes, you end up with a large plant that doesn't produce many peppers. 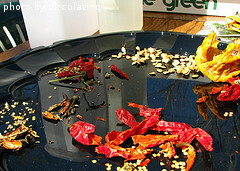 The peppers that are produced are often not pleasing to the eye or the palate. Once you have an heirloom variety, the next step is to harvest the seeds. It's best to wait and the let the pepper fully ripen and dry while it's still on the plant. Trying to time this before a hard freeze can sometimes be tricky. If you have the space, plant an extra pepper plant for the sole purpose of seed production. 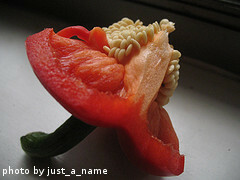 Don't harvest any peppers from that plant and let it go until you have at least 1 dried out pepper. After the peppers are dry, you will be able to hear the seeds rattling around inside them. Break open the pods and remove the seeds from inside. If they are still just a bit damp, spread them out on foil or a baking sheet to dry for another couple of days. Once the seeds are fully dry, you can put them inside an envelope and store them in a jar in your refrigerator. Make sure you label the envelope so you know what seeds it contains. If you are saving lots of different seeds, several envelopes can fit inside one, quart-sized jar. It's also a good idea to put a tablespoon of dry rice at the bottom of the jar just to absorb any moisture. Click on the following links to learn more about growing peppers.